I hope none of you think you’ve escape the clutches of my ongoing “Clone Saga Callback” retrospective just yet. We only get one shot to celebrate the 20th anniversary of what many consider to be one of the worst Spider-Man stories ever published (I’m still not ready to concede that point, but it’s definitely among the most controversial). And I’m definitely one of those people who likes to go “all in” when he commits to a series. In isolation, it’s not a bad story per se – a sentence I feel like I’m going to find myself writing with increasing frequency as this retrospective plays out on my site – but it introduces a ton of new information and mysteries, few of which ever get played out to any kind of satisfying resolution. 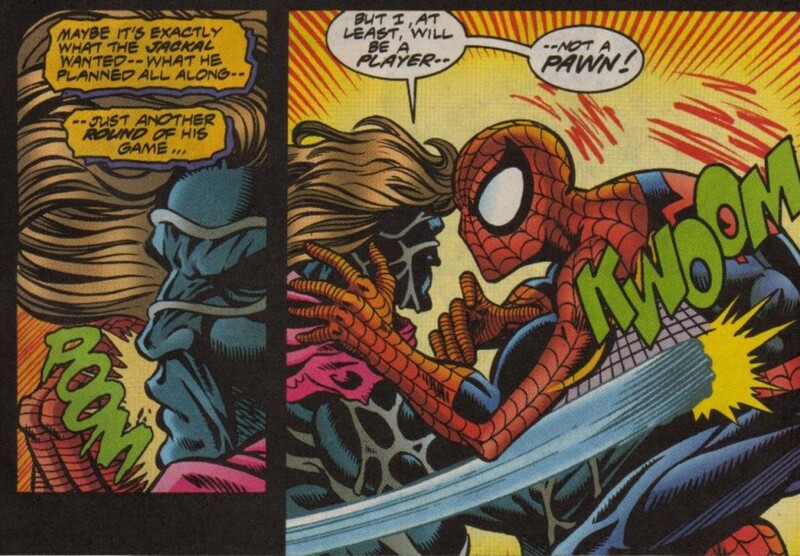 What makes “Players and Pawns” even more aggravating is how effective the prior storyline, “Smoke and Mirrors,” turned out to be in terms of laying out the main mystery/drama of the first “act” of the “Clone Saga” – aka, who between Peter Parker and Ben Reilly is the “real” Spider-Man and who is the clone. But as a follow-up, the Spider-Man brain trust decided to double down on the mystery element, and introduce even MORE characters and would-be red herrings. History would later show that because these early “Clone Saga” issues were such big sellers, the Spider-office was required to stretch the story out as long as possible. I guess the story’s creative team was tasked with an impossible mission in taking a rather interesting premise (Spider-Man’s clone returns, raising questions about Peter’s claims to be the real deal) and then having to add so much filler to it so that a six month story becomes a year-long (and later two years-long) saga. But impossible mission or not, the Spider-office played a dangerous game in testing the patience of their audience – and as we all know 20 years later, it’s a game that unquestionably backfired. The most bothersome plot development in “Players and Pawns” is the introduction of a THIRD Peter Parker clone. Because having two characters staking a claim to be the one true Peter from the Stan Lee/Steve Ditko days clearly wasn’t enough for the “Clone Saga.” So instead, the readers get treated to a character that is essentially an amnesiac, hitchhiking his way to New York so he can wreak havoc on the overall efficiency of this storyline. Again, we had only just learned a few weeks earlier via “Smoke and Mirrors” that both Peter and Ben might have a case in claiming to be the original Peter. That’s compelling stuff on its own, and “Players and Pawns” does go out if its way to advance the thrust of that storyline by having both Peter and Ben get seemingly reliable intel from separate sources that they are the definite article. Adding a third candidate to the mix – a candidate with no discernable personality that would engage him to the audience, thereby adding intrigue to this already complex mystery – feels like a twist thrown in there just for the sake of it. When you consider the role of Kaine – ultimately revealed to be a disfigured clone of Peter – throughout “Players and Pawns,” you then realized you’re actually dealing with four different versions of Peter. That’s nuts. 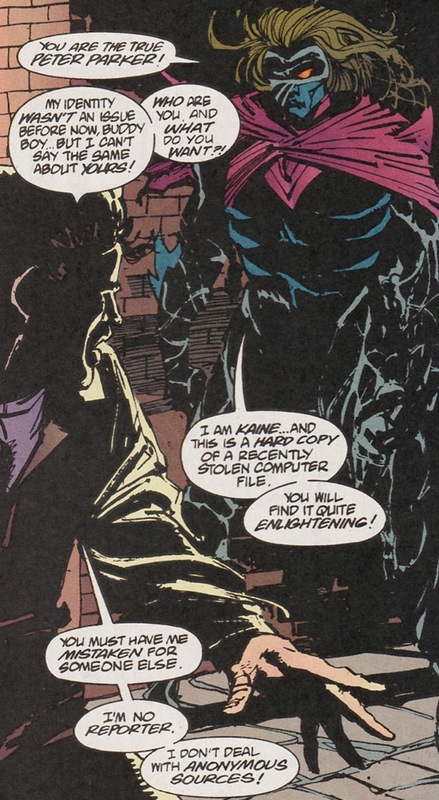 The depiction of Kaine is actually very well thought-out in this storyline. It’s clear that the two writers, Tom DeFalco and Terry Kavangh, were trying to flesh out the character a bit and develop him into something more than a crazy sociopath who murders classic Spidey villains and has an unhealthy fascination with Mary Jane. His confrontation with Peter and Kaine’s reluctance to fight him, is quite effective in making the character more intriguing. Over the span of a couple of pages, Kaine is transformed from a character that is languishing in terms of his inevitable identity reveal, to someone the reader is likely looking forward to seeing more of as the storyline unfolds. 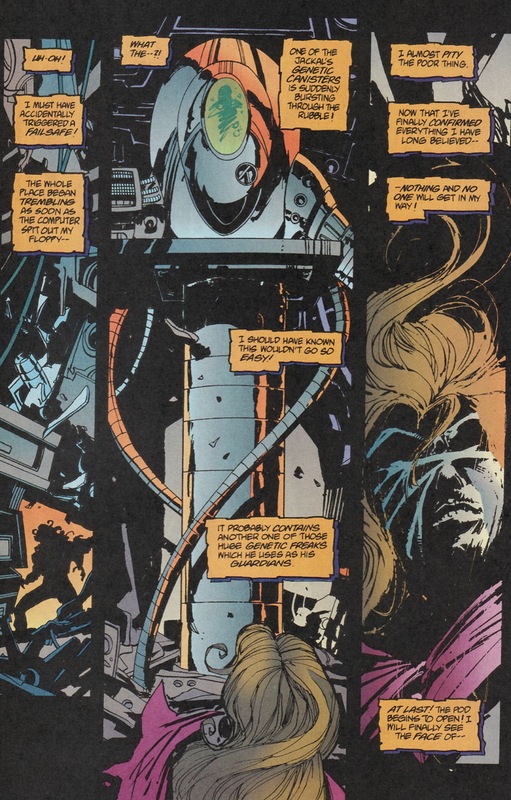 And given how Kaine may very well be the most successful entity to rise forth from the “Clone Saga,” you could say that “Players and Pawns” was the first solid step the character took on that path to being a cult favorite. But Kaine’s characterization alone doesn’t make “Players and Pawns” a particularly good story, and for every smart bit of character development, there’s something equally as bad to be found elsewhere. While it was initially teased in “Smoke and Mirrors,” “Players and Pawns” is the more tangible ground zero for the Jackal’s new status quo – that of an un-killable, Joker-esque supervillain – a characterization he’s still maintained to this day. 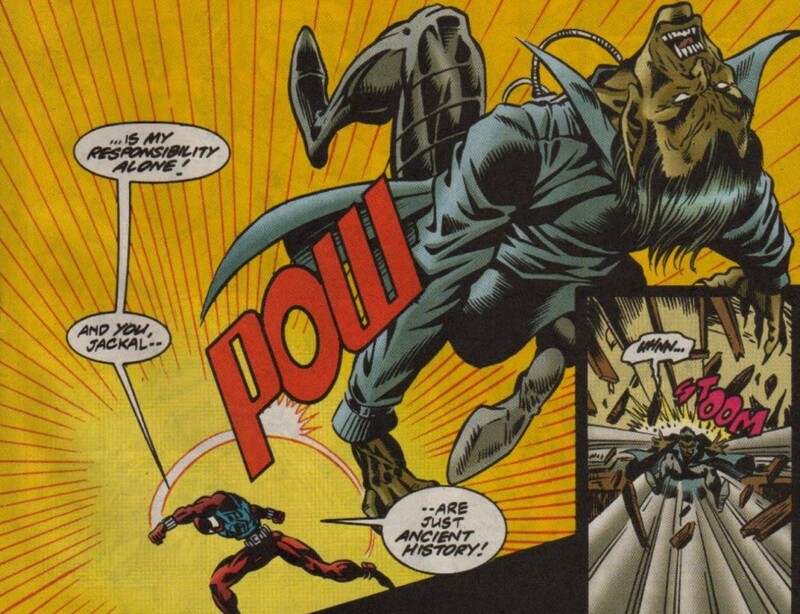 I’ve always had a difficult time buying into the Jackal as a potential “A” list villain for Spider-Man, in large part because part of his initial intrigue as a character was the fact that he was essentially someone random from Peter’s life that came back to haunt him in the worst way possible. Professor Miles Warren’s transformation into the villainous Jackal was born from his descent into madness following the death of Gwen Stacy. So his very existence is another example of how Peter’s great powers as Spider-Man indirectly yielded more trouble for him, since his failure to save Gwen spurred the Jackal’s creation. But the random tragedy of the character is lost once he’s characterized as some kind of diabolical mastermind. Basically, Warren tries and fails to conquer Spider-Man all the way back during the original “Clone Saga” in the Bronze Age. 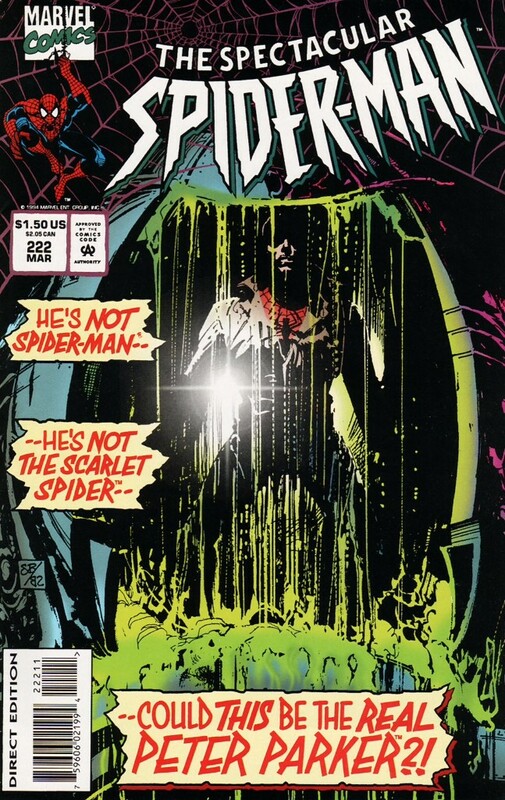 His death in Amazing Spider-Man #149 proves to be a fitting capper to the character’s life. Giving him all of these body doubles and henchmen and having him attack a group of school children (and Flash Thompson) in order to draw out Peter and/or Ben just feels disconnected to how the character was portrayed beforehand. Sure, we want to see all characters grow, but perhaps it would have been better if the Spider-office had just left well enough alone when it came the Jackal. Similar to the multiple Peter Parker clones subplot, the Jackal’s status quo shift would only become more frustrating as the “Clone Saga” continued. We get a short reprieve with the absolute classic “Amazing Spider-Man #400” following “Players and Pawns” (I’ve written about ASM #400 a ton over the years, so I suggest you just read one of those articles rather than have me post something AGAIN about it), but things quickly get bogged down following Aunt May’s (temporary) death.